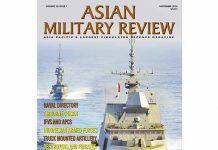 This is the June/July 2018 issue of Asian Military Review. This is not the latest issue. 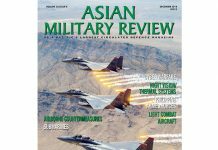 Land Warfare: Anti-Missile Defence Analysis: North Korea’s stated missile capability poses a threat, no matter what happens at the proposed US-North Korean summit. Jon Lake report. 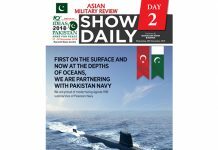 DSA Report: Defence Services Asia 2018 Snapshot: Andrew Drwiega reviews some of the important deals agreed during the show. 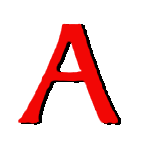 Sea Power: Ballistic Missile Defence in Asia Pacific: North Korea’s stated missile capability poses a threat, no matter what happens at the proposed US-North Korean summit. Dr. Joetey Attariwala report. Land Warfare: Big Punch Weapons for Troops in contact: Stephen Miller writes that the importance of squad-portable support weapons retains its relevance on today’s battlefields. Land Warfare: Light and practical ISTAR on the go: Peter Donaldson looks at a variety of new ISTAR aids for dismounted troops. Sea Power: Amphibious Assault: Landing troops in the littoral demands more speed and greater volume than ever. Stephen Miller reviews progress made. Regional Militaries: No Peace Dividend Yet: JR Ng finds no slackening of effort to maintain the equipment and skills of South Korea’s armed forces. 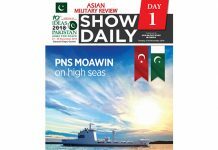 Sea Power: The Naval Workhorse: Tim Fish examines the rise in popularity of Offshore Patrol Vessels.